Have a question on Vanquish? Vanquish is available in 25 different colors - Lightning Silver, Hammerhead Silver, Kopi Bronze, Silver Blonde, Mariana Blue, Ocellus Teal, Onyx Black, China Grey, Cobalt Blue, Marron Black, Stratus White, Midnight Blue, Jet Black, Sunburst Yellow, Diavolo Red, Divine Red, Selene Bronze, Morning Frost White, Concours Blue, Sea Storm, Silver Fox, Arizona Bronze, Volcano Red, Skyfall Silver and Appletree Green. Watch latest video reviews of Aston Martin Vanquish to know about its interiors, exteriors, performance, mileage and more. Known for its speedy wheels, the British Sports car manufacturer- 'Aston Martin', has been presenting the world with some of the most exotic cars since a century. As time has progressed and the British luxury sports car maker has chipped down its traditional edgy design to fit-and-fine finish that gives its model a classy aura and one such example is the newly introduced “Aston Martin Vanquish”. Introduced in 2001 as the successor of its aging Virage range, the Vanquish gained a huge fame with its tempting design and revved-up engine, and now with its revised model under the roof, the Vanquish is all set to blaze the track. Classy looks of the Vanquish transfers its essence to the interior also. With 2+0 and optional 2+2 seating configuration, the Vanquish offers nice space to the driver as well as passengers in order to gain the full motor sport feel. Alacantara headlining and full-grain leather interior of the car evokes your senses and makes you wrapped with luxury all around. Personalized sill plaques and headrest embroidery of the logo realizes about pride and dignity the brand holds. Rotary dial controls, 6.5-inch heads up display and 1000-watt Bang and Olufsen sound system are nicely immersed in the centre console that makes the operation facile and fatigue-free. Carbon edition of the Vanquish may make you feel devil inside the detail, offering intensely refined carbon black reflects on the interior, the car holds a sufficient in class boot space of 368-litres. New generation bonded aluminum frame structure of the Vanquish holds a carbon fiber VH architecture, that gives it a hyper car trait. 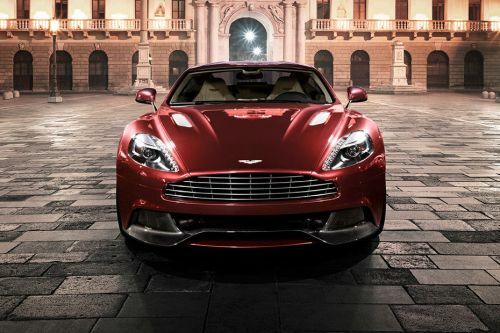 Traditional radiator grille with chrome garnishing and the wind cutters integrated to the bumpers makes ample use of the air obstructing the Vanquish. Bi-Xenon headlamps with nicely jeweled day time running lights offers ample visibility to the driver while cruising in dark areas. Chrome bordered air vents with unified body lines revels the performance package it is loaded with. Protruded rear wheel arches and body integrated rear spoilers offers a nice passage to the air thus nourishing the performance of the vehicle. Measurement of 4692mm X 1912mm X 1294mm (LXWXH) brings a sporty appearance to the coupe silhouette of the car. 20-inch gloss black tinted alloys of the Vanquish holds an all-season Pirelli tyre size of 255/35 ZR20 at the front and 305/30 ZR20 to the rear. In order to honor this spectacular masterpiece, the brand has also come up with its carbon edition which defines the car meticulous details. Roaring inside the hood is a 5935 cc V12 devil, that booms out giving a maximum power of 565 bhp that too at 6750 rpm, whereas the special edition does it at a slightly revised figure of 568 bhp. With the traditional rear wheel drive arrangement, the Vanquish delivers a rubber smoking torque of 620 Nm at 5500 rpm. Housing a 6-speed 'Touchtronic II' transmission, the vanquish does an incredible 100 km/h in just 4.1 seconds. At the same time the body aero kits installed in the Vanquish allows it to nail down a top speed 295 kmph. But its special edition cracks 100 kmph in just 3.6 seconds and with gas on, it reaches to maximum speed of 323 kmph. Putting on such a high performance , the Vanquish still manages to deliver a combined mileage of 8.33 kmpl. Carbon ceramic composition of the disc is the attribute borrowed from the hyper car drives that makes it a booming package of power and performance. With anti-lock braking system affixed, the car offers a safe and consistent braking performance, that is truly a compulsion for this high performance car. Aluminum forged independent double wishbone suspensions comes with anti-dive geometry and adaptive damping system that offers you varied mode (Normal, Sport and Track) of driving. Positive torque control and traction control grips the tarmac while cruising at neck-breaking speed thus reducing the risk of slippage. Beneath the muscular skin of the Vanquish is a super-strong and super-stiff skeleton that offers maximum impact energy at the event of collision. Being probably the current flag-bearer of the Aston's line up, the Vanquish stays a decent package of performance and comfort. With astonishing design and nice dynamics the Vanquish makes a tough competition in its segment and is surely a tremendous example of advancement. What is the price of Aston Martin Vanquish? On road prices of Aston Martin Vanquish in starts from AED1.3 Million for base variant Ultimate GT, while the top spec variant S The Ultimate Super GT costs at AED1.55 Million. What are the colors options available in Aston Martin Vanquish?